To see this form, click on the New... button on the main "Your Puzzles" display. Description: Give your puzzle a name of up to 70 characters. 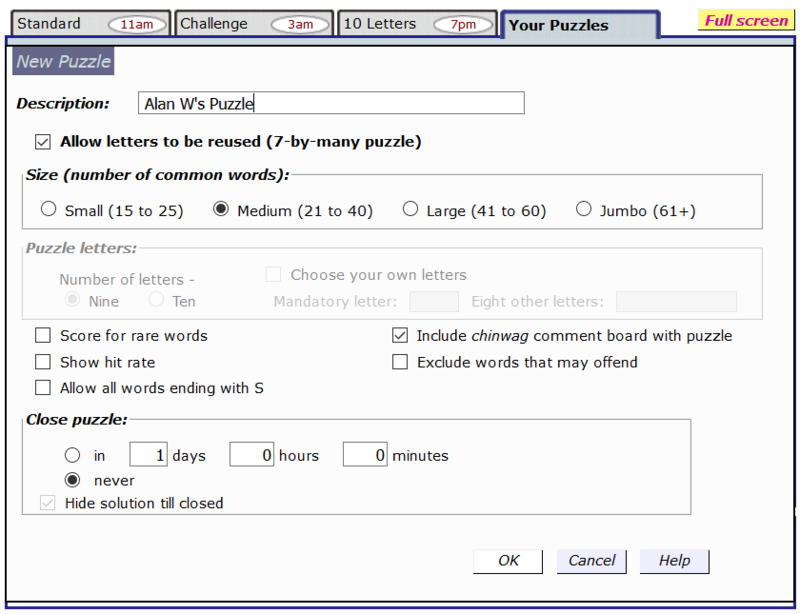 Allow letters to be reused: Select this for a 7-letter puzzle where each letter can be used more than once in a word. Mandatory letter: If you are supplying the puzzle letters, input here the letter that will have to be included in every word - the letter in the middle of the letter layout. Eight / Nine other letters: If you are supplying the puzzle letters, input here the remaining letters you want to use. The mandatory and other letters you select do not have to make a word that uses all the letters. Score for rare words: If you select this, the scoreboard will reflect all the valid words found, including many quite obscure ones. If this is not selected, only the more common words will be counted in the scores, although rare words will still be accepted. Show hit rate: The hit rate is the percentage of words tried that were accepted. If you click this box, the hit rate is shown on the scoreboard. Allow all words ending with S: This option allows all plurals and verb inflections, including those ending with S. A puzzle created with this option will not necessarily include an S, but when it does, you will be able to use all plural words. Exclude words that may offend: Selecting this option ensures that the puzzle you make is free from a wide range of coarse words, including expletives and racial epithets that some players might find offensive. The option is not available if you are choosing your own letters. Close puzzle: The puzzle you make can close after a nominated time, or remain open indefinitely. Once the puzzle is closed, the scoreboard is frozen. Hide solution till closed: Here you specify whether players can look at the solution as soon as they've played all the words they can think of, or have to wait until the puzzle is closed. A player who has looked at the solution will not be able to play any more words. This option does not apply to a puzzle that never closes.